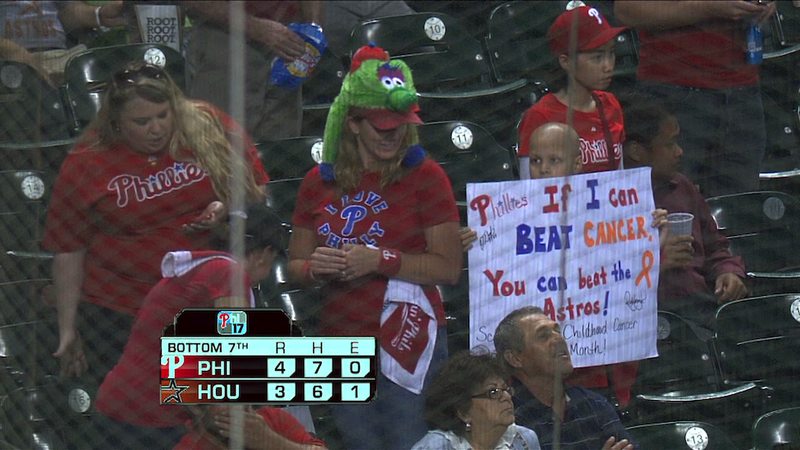 Kid's Sign At Phillies Game: "If I Can Beat Cancer, You Can Beat The Astros"
This year's Astros team has drawn plenty of unfavorable comparisons, but now we finally can add one worse than the '62 Mets to the list: childhood cancer. A kid at last night's Philly-Houston game was spotted holding the above sign, which, considering the incredible strength required for a child to beat cancer and the current state of the Astros organization, reads more like an impatient directive than uplifting encouragement. Unfortunately, Houston rallied in the eighth inning to score three runs, proving that even when they win, the Astros screw everything up horribly.